Home » What is Lead? Lead is a poisonous metal that our bodies cannot use. Lead can be found in air, soil, water and even inside homes. What does lead do to the body? There are no safe levels of lead. Lead stops good minerals (such as iron and calcium) from working well in the body. This can cause serious problems with the health of you and your family. Lead can affect anyone, but it hurts women of childbearing age and young children most. This is due to rapid growth. Children’s bodies are also smaller, so are impacted more by the same amount of lead. Too much lead can cause problems with growth, hearing, speech, behavior and learning. Contact your local WIC Office for more information about lead related services. Wash dust off hands, toys, bottles, windows and floors. Do not let a child eat or play near loose paint chips. Help may be available through the Milwaukee Health Department, a local clinic or a contractor trained in lead-safe practices. City of Milwaukee Childhood Lead Poisoning Primary Prevention Program for replacement of windows with lead paint. Program is for the following zip codes: 53204, 53205, 53206, 53208, 53209, 53210, 53212, 53215, 53216. Lead laterals (water service lines) to homes built before 1962. Use a water filter certified to remove lead (look for “NSF/ANSI 53” on the label/description). Learn more about lead safe water filters. If you do not yet have a water filter, run tap water on cold for three minutes between uses. Cook and drink only with filtered or cold tap water. This is especially important for women of childbearing age and children under 6 years old. Warm or hot water often contains higher levels of lead. Do not make infant formula with hot tap water. In the City of Milwaukee, call 414-286-2830 to check if your home is connected to a lead lateral or visit the City of Milwaukee water quality website. You may be eligible for a free water filter, find out more about the water filter program through the City of Milwaukee. Cover any bare soil in your yard (including garden paths) with mulch, wood chips, gravel, perennials or grass. Avoid gardening within 15 feet of your home, garage or painted fences. Garden in a raised bed filled with 8 to 10 inches of clean soil. Layering landscape fabric before adding clean soil will prevent roots from growing in potentially contaminated soil. If you need help, the Victory Garden Initiative can help build raised garden beds. Take your shoes off outside to avoid tracking dirt into your home or apartment. Wash hands thoroughly after gardening, using soap and water. Hand sanitizer kills germs, but it does not remove lead! Wash all garden produce well, especially root vegetables like carrots. “Lead in Home Garden Soil” (2015) at https://learningstore.uwex.edu/Assets/pdfs/A4089.pdf. Feed your family regular meals and snacks. The body takes in lead faster if your stomach is empty. Serve foods that have the following nutrients: iron, calcium and vitamin C.
You may be eligible to attend a FoodWIse class that can help you and your family learn how to eat healthy on a budget. Participate in free federal nutrition programs such as WIC, Summer Meals, Farmers Market Vouchers, FoodShare (SNAP) and many more. 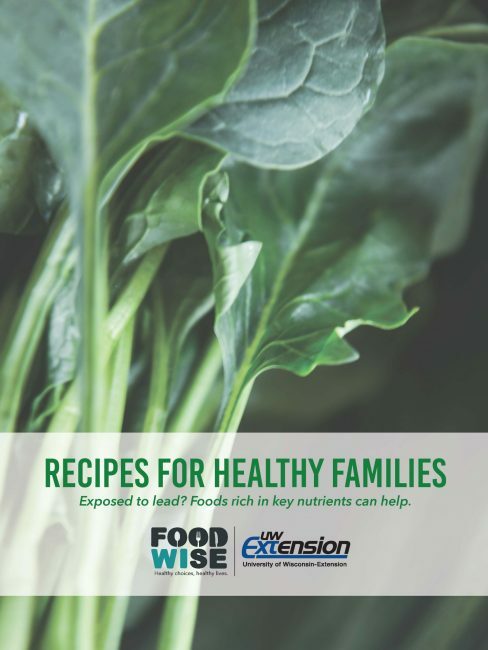 Click on the image above to view a recipe book featuring foods rich in key nutrients. Can food help if lead levels are already high? Healthy foods are not likely to lower lead levels in the body. But they can help protect you and your family from taking in (“absorbing”) more lead. Healthy foods can help support your child’s growth in other ways (reading, math and social skills). This may help reduce the impact of lead on your child’s life. SNAP/FoodShare helps families buy the food they need for good health. Visit access.wi.gov to learn how to apply or visit Hunger Task Force to find assistance in applying for FoodShare benefits. Pregnant and postpartum women, infants and children who are eligible may receive nutritional support and referrals to health care services from WIC. Find a local WIC clinic. Dial 211 or visit http://www.211wisconsin.org/ to find emergency food.